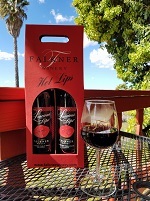 Try our wonderful warm holiday wine made with our Red Luscious Lips and mulling spices. Enjoy the refreshing nature of this slighty sweet, easy drinking fall/winter wine. Package includes 2 bottles of Red Luscious Lips, mulling spices, and recipe on the box.